Recent reports say that parts of Eastern Canada have spectacular fall colours this year, and the pursuit of “leaf peeping”, as it’s known back East – viewing and photographing fall colours – is in full swing. With our temperatures dropping to single digits, and the season’s first snow dusting the North Shore Mountains this past weekend, it’s the right time to do a little local “leaf peeping.” While we don’t have whole mountainsides covered with deciduous trees – our dominant trees are evergreens – we still have some real beauty to enjoy. We just have to look a little closer. 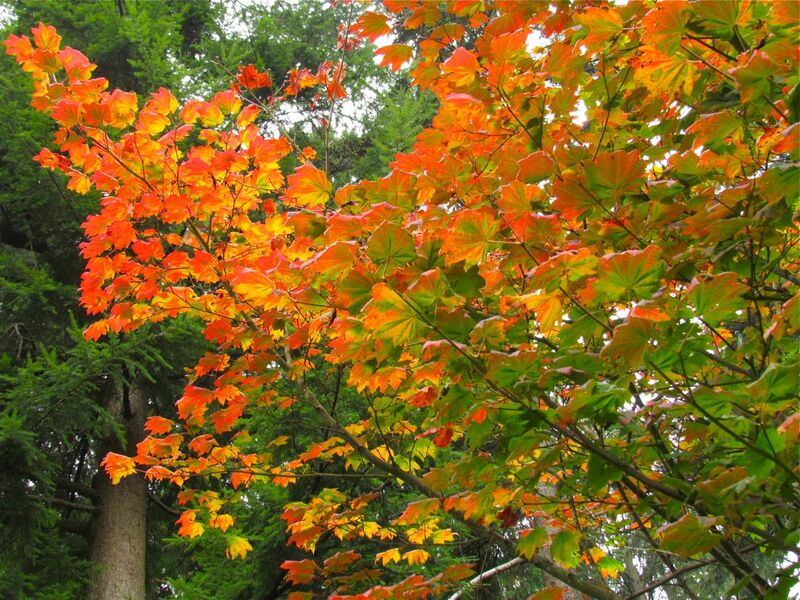 Our native red-leaved species include the red-osier dogwood above – a common shrub in our parks, and the vine maple, a small tree which can be a spectacular contrast to the dark greens of our forest conifers. 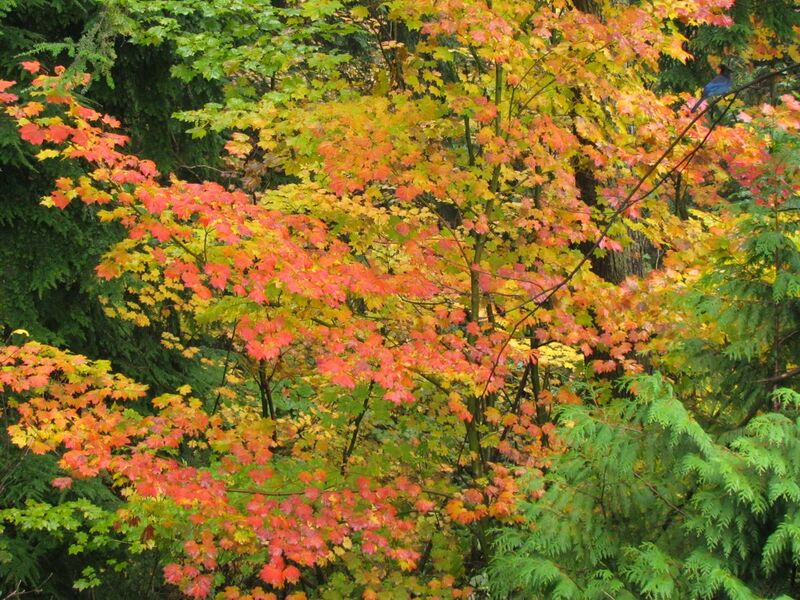 So why do some trees’ leaves turn red, and others yellow? It’s all about the chemistry of leaves. As the amount of daylight declines in the fall, leaves stop making food through photosynthesis. The food maker, the green stuff of leaves, is chlorophyll. 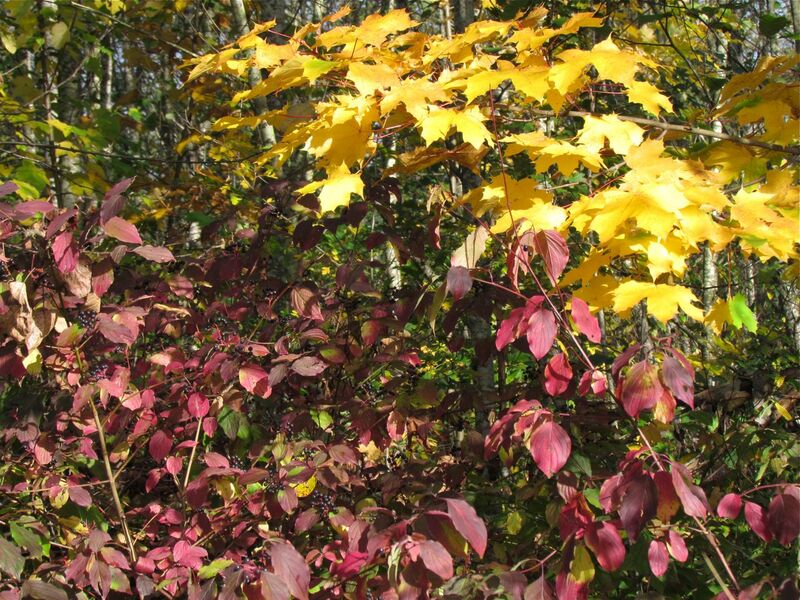 In fall it stops being replaced by the tree or shrub, and slowly degrades and disappears from the leaves revealing the yellow pigments previously hidden. Here’s an example of a big-leafed maple – our large, native maple – showing the process in action. 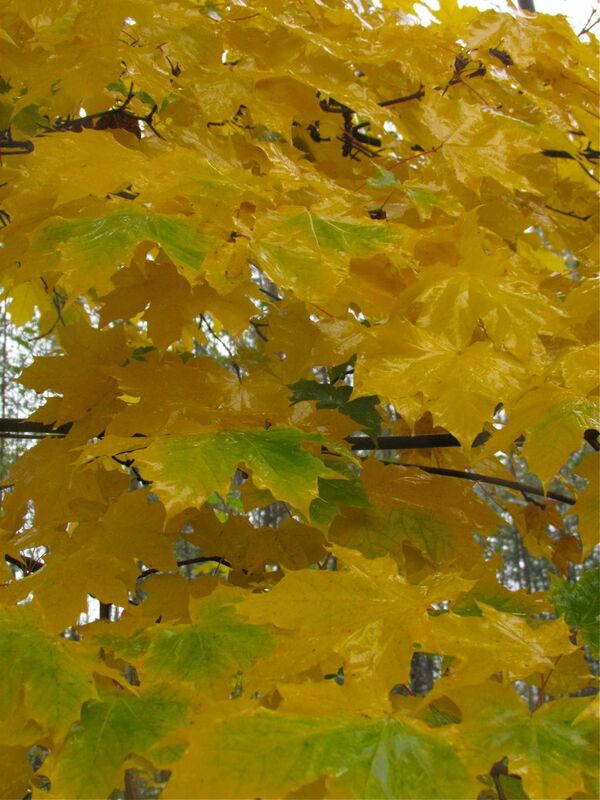 As the green chlorophyll disappears, the yellow pigment is revealed. In technical terms, the degrading chlorophyll slowly fades to reveal the xanthophyll pigments in the leaves. For trees with red fall leaves, a slightly different, but related process takes place. The decline in chlorophyll is accompanied by the production of anthocyanins (red pigments) related to the end-of-season increase in sugar production and storage in the trees. Red-osier dogwood shows this process well. 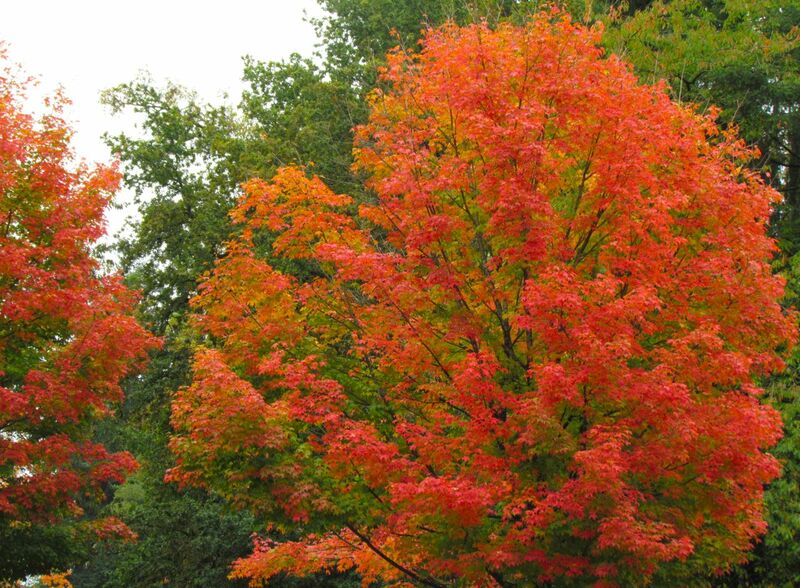 Our bright red street trees undergo the same changes, but most of them are Eastern imports planted for easy maintenance, and of course for their spectacular fall colours. 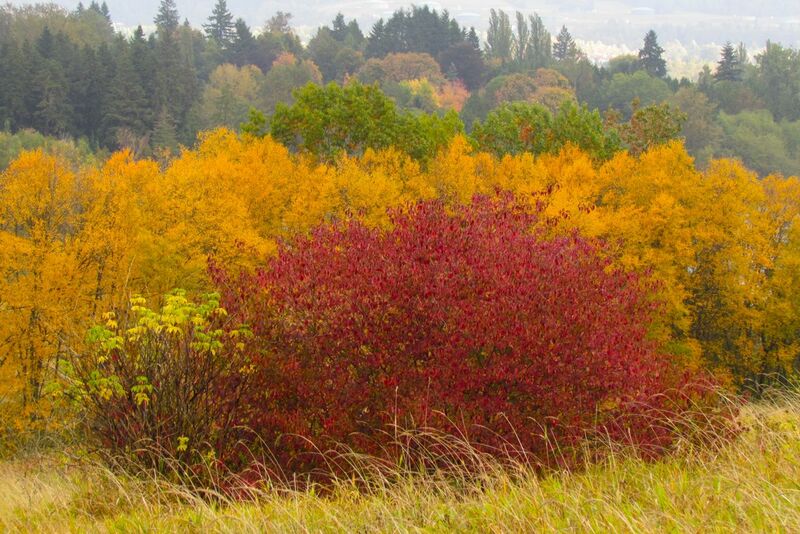 So while we don’t have mountainsides of red, we have our fall beauty on a smaller scale. And finally, just to show the birds haven’t been ignored this week, here’s a vine maple nicely setting off the blue of a Steller’s Jay. You’ll have to look closely to see it. Can’t see it? Click the image to enlarge it, and take another look. When I took the picture, I didn’t know I’d captured the bird too! While our fantastic stretch of sunny weather hasn’t quite been replaced by Arctic conditions yet, the constant, lashing rain is a reminder we really are in October, and frost and snow may not be too far ahead for us. 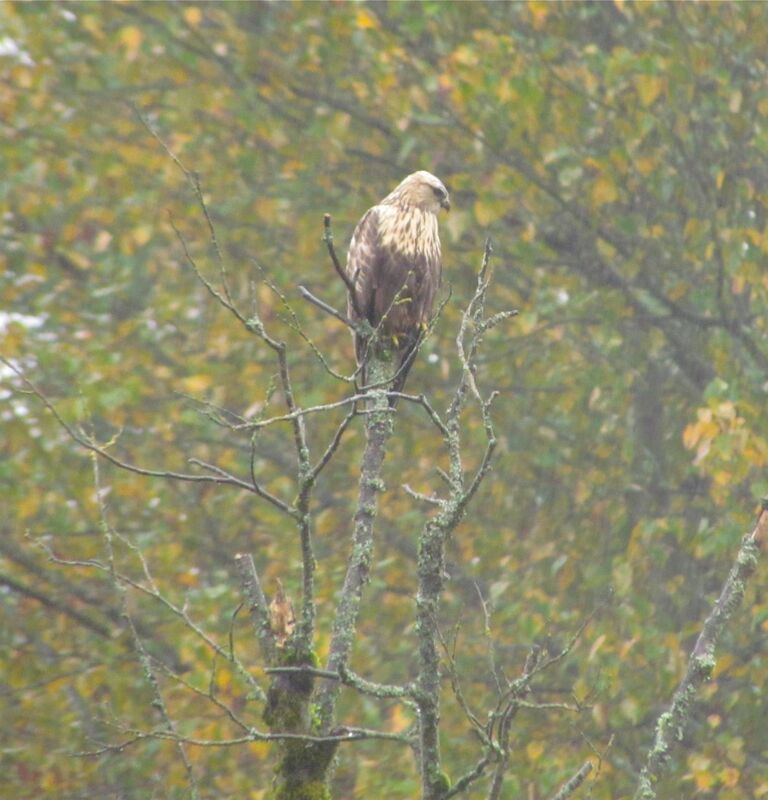 Big changes in weather often signal changes in our birds too. In late summer and fall, many leave us for more southerly locations, while others arrive here on their migrations, sometimes staying for the winter, and sometimes to stop-over, fuel-up and move on. On Saturday morning at Deer Lake another harbinger of winter arrived, and this time the message was straight from the Arctic. A beautiful Rough-legged Hawk, a relative of our resident, breeding Red-tailed Hawks, stationed itself on a tree at the east end of the west meadows at Deer Lake, intently scoping the long grass for voles and mice. In absolutely pouring rain, getting a good picture can be a little tough, and the one above shows the not quite satisfactory result. However, rough-legs are a rare sight in our parks, more often spending their winter around Boundary Bay, Delta. Interestingly, this bird is using exactly the same small meadow that the last rough-leg that I saw in the park many years ago used. The habitat here is likely similar in appearance to its Arctic tundra haunts, where it also hunts rodents, including those cute lemmings. As I’ve noted before on this blog: everyone has to eat! The Rough-legged Hawk is a really cosmopolitan species. Breeding on tundra around the whole Arctic – usually on cliffs, promontories, bluffs and other high outcroppings – it moves south in winter in Asia and Europe, as well as here in North America. And in case you were wondering, the name ‘Rough-legged’ refers to its feathered legs, which are an adaptation to its cold climate home. The bird was still present Saturday afternoon, and may hang in for a while. So take the time and see our Arctic visitor to Burnaby. It’s as easy as A to B. Wherever a rare bird puts in an appearance it’s likely to quickly draw a crowd, especially if it’s easy to access, and near an urban centre . 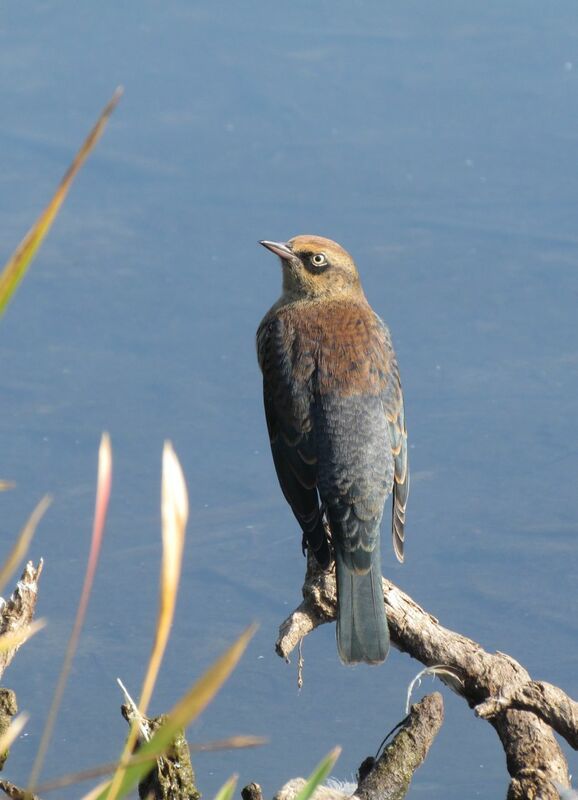 The Rusty Blackbird that showed up on Friday at Piper Spit on Burnaby Lake fit the pattern perfectly. News of the bird was soon flying around (couldn’t resist that pun) the birder and photographer networks, and people were headed down to the Spit from around the Lower Mainland: Vancouver, Surrey, and the Fraser Valley. Bonus one – the Thanksgiving weekend gave people time to make the trip to the lake. So what’s the big deal? 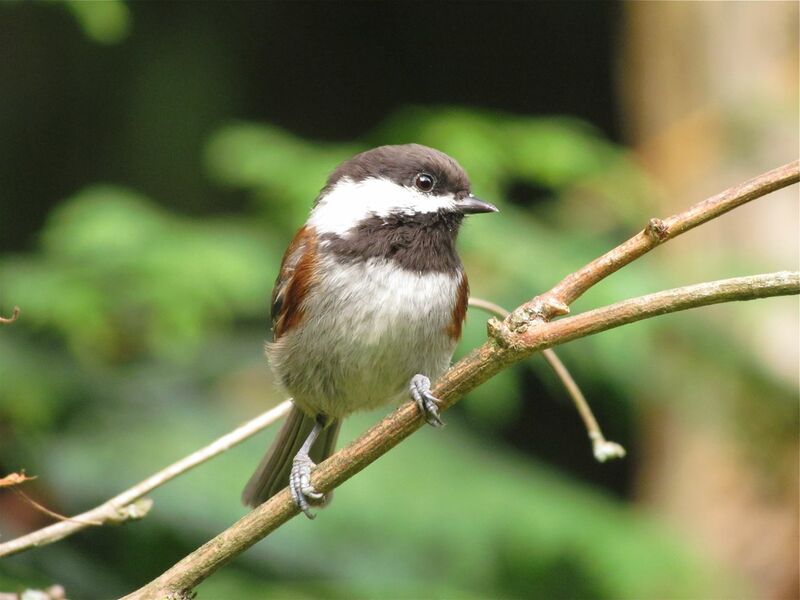 Well for birders it is a rare bird, meaning it shows up most years in the Lower Mainland, but in single-digit numbers, frequently one or two only, and often for just a day before moving on. In birder parlance, they’re usually one-day-wonders. Hence, the rush by many to see and photograph the bird, before it left. Last year the same species showed up here at Piper Spit, and it was a one-day wonder. Many people missed it, including me. Bonus two – the bird has been here for at least four days. While a few rustys show up in the Lower Mainland most years, nearly all Rusty Blackbirds winter in the south-eastern US, along the Atlantic Seaboard to Florida, and throughout much of the eastern drainage of the Mississippi. So our Burnaby bird is quite far out of range for the species in fall/winter. Its breeding range, however, is quite different; it stretches right across Canada, east to west, and extends into Alaska. The birds breed in muskeg, bogs, beaver ponds, and wet, boreal forests as far north as the tree line. A real Canadian, eh? It’s the most northerly breeder of all the blackbirds, which is why it’s something of a mystery bird. It’s little studied because of its mostly remote summer haunts, and its breeding biology is poorly known. Compounding the mystery of its life cycle, is the mystery of its rapid decline over the past thirty or more years. Although some sources suggest we simply do not have enough information to draw definitive conclusions about the population changes of this species, there are many experts expressing concerns. 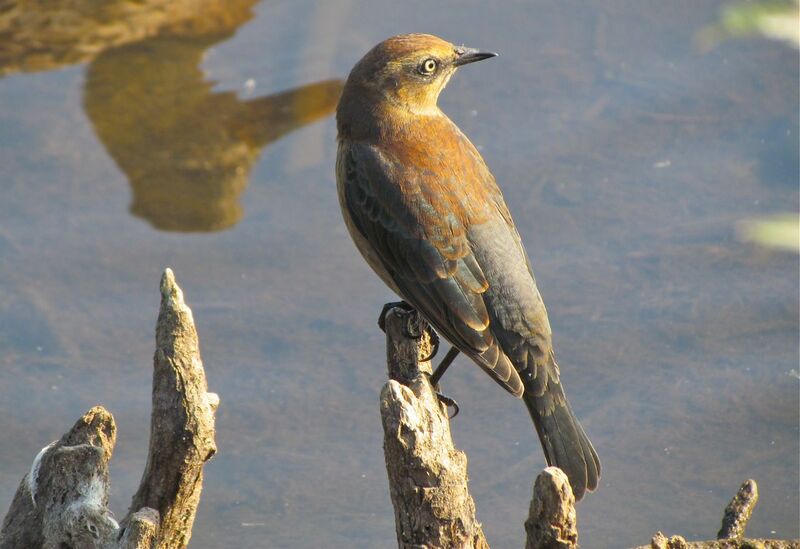 For more information about the declining population of the Rusty Blackbird click here. Locally, however, but having no bearing on its continental population, is some good news. Bonus three: a second bird turned up on Monday. There are now two Rusty Blackbirds at Piper Spit. To get one rare bird is a treat, but to get a second hanging out with it, is a wonderful happenstance. And even better is that these birds are very tolerant of people, and provide really good opportunities to observe them. 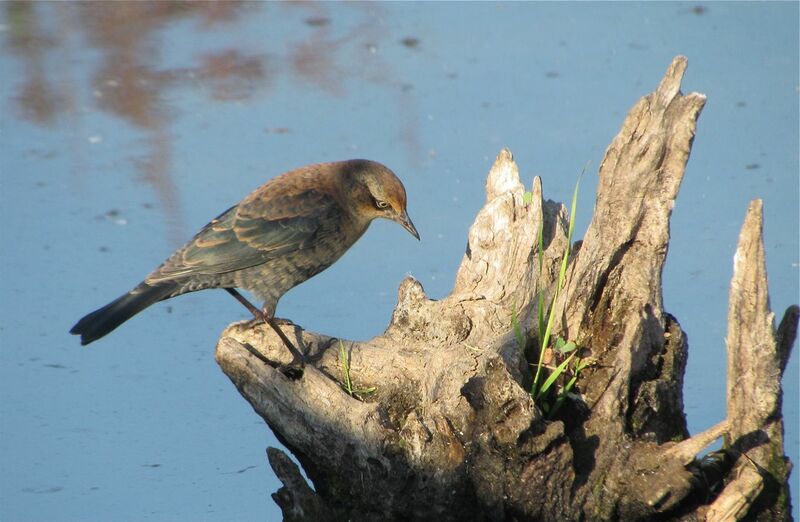 When they do show up in the Lower Mainland, Rusty Blackbirds are usually skittish, and difficult to observe. So head on down to Piper Spit and check out the new arrivals. They’re very cooperative, and show off their rusty-coloured winter plumage beautifully in the sun. If Stellar’s Jays think like we do (they probably don’t), then I can imagine the one above is pretty pleased with itself. Holding a peanut in its bill from my backyard feeder, this bird is about to fly off with its prize to hide it away in a Deer Lake forest. In ornithological lingo, it’s caching food, for use in winter. When temperatures are low, when food is a lot harder to come by and maintaining body heat requires extra calories, these birds will return to their caches to fuel up. It’s an avian lay-away plan for winter. 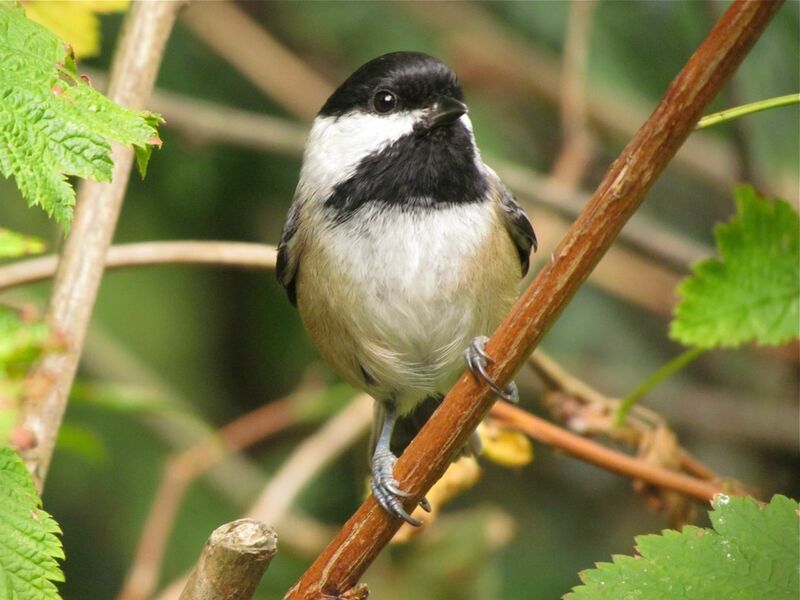 Black-capped Chickadees, like the one above, cache smaller items such as the sunflower seeds they collect from our feeders. 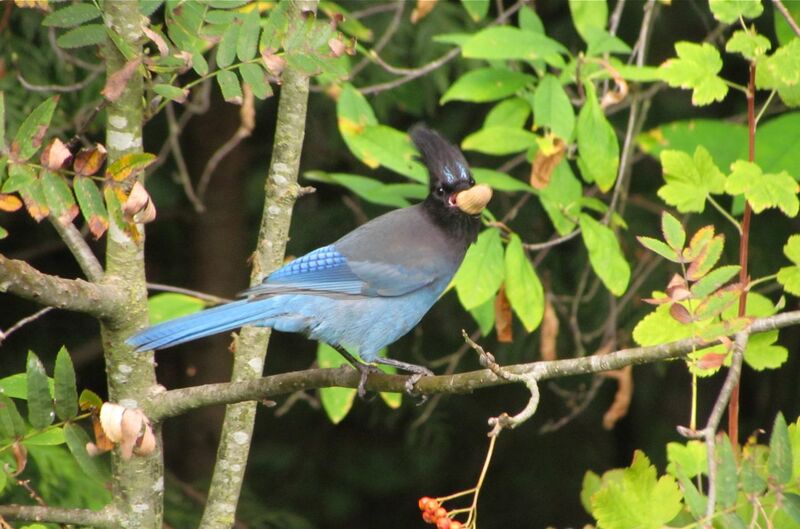 Peanuts, good for Steller’s Jays, are much too large for this little bird to cache. If you have a feeder at your house, I expect you’ve noticed a lot more activity lately, and that your seed supply is diminishing more rapidly than usual. At this time of year chickadees are visiting our feeders so often they couldn’t possibly be eating all the seed they’re carrying away. Of course, they’re not. Like the Steller’s Jays, they are on a major caching binge. It’s that time of year, and there’s a flurry of activity to store a back-up food supply for winter. 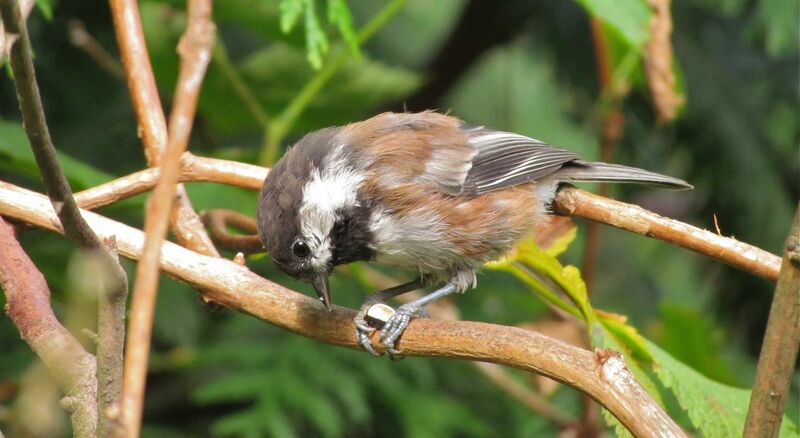 Chestnut-backed Chickadees (below), our other common local chickadee, are also madly gathering seeds to cache. Sometimes birds put a lot of food in a single location, but more frequently they cache small numbers in each place, and very often they cache single food items separately. So you can anticipate the problem here. Most of us have one or two sets of house or car keys, but if you’re like me, knowing where they are at any one time is often a major challenge. Where are my keys?! So how can these bird-brains remember the location of hundreds of different caches? How can they remember their cache locations even when they’re under the snow? The answer is – birds are just better at some mental activities than mammals, including humans. A little humbling isn’t it? But they do have a nice built-in biological advantage over us. They regrow part of their brain each year to accomplish these astounding feats of memory. The hippocampus, the part of their brain involved in spatial memory, regrows brain cells at this time of year. Old cells are replaced by new ones, and old memories are replaced by new, as this year’s cache locations are laid-down for later retrieval. Couldn’t we all do with a little bit of that ability? I’m really sure a new brain, or at least part of it, would really help in so many ways! Of course it’s not all hard work. Sometimes it’s break time, as this Chestnut-backed Chickadee above is showing. Not every seed is cached; sometimes it’s just eaten. The bird here has peeled off the outer husk of a sunflower seed, and is just finishing up the energy-rich kernel inside. But all is not plain-sailing in the caching business. Not every bird is focussed on their own caching. The smart ones out there are looking about to take advantage of the unwary. Most jays and chickadees are careful not to let other birds see where they’re hiding their cache. On the other hand, some birds don’t seem to pay attention at all to others watching them. All that hard work, and their carefully cached food is quickly stolen and hidden elsewhere by the wily cache thief. A cache grab indeed.